Youngstown State University President Jim Tressel recognizes the need to dedicate more resources to students of color, but said we need to prioritize work that can be done without additional resources, citing budget constraints. He said this not only applies to the administration, but also to students as well. Eddie Howard, associate vice president of student experience, said we also need to prioritize repositioning existing funding strategically. Tressel said this is why he and Sylvia Imler, executive director of multicultural affairs, created the Culture of Community Collaborative. The initiative seeks to create a vertically integrated group of students, faculty and staff across campus. The collaborative would report to the administration and a smaller culture of community committee. They intend to encourage inclusion and diversity across campus. Tressel and Imler have spent the past few months discussing it with various organizations on campus. The group has grown to include around 70 representatives. Tressel said that many of the strategies to improve black student experience coincide with the goals of the Culture of Community. “[Culture of Community] is an intentional effort to get people to get involved, become aware and respect things that they haven’t had experience with before,” he said. Julian Jones, president of the Student Diversity Council, said the collaborative can combat the issue of segregation if the right people are chosen. “I think it will [help] if they are appointing the right people. Some people really don’t want change, and you need to be willing to change if this is something you want to do,” Jones said. Imler addressed the ability of the Culture of Community to properly target black issues concerning students while still being broadly oriented toward diversity. Tressel said he demanded increased diversity among the presidential mentors when he first arrived at YSU. William Blake, director of the office for student diversity, supported Tressel’s commitment to diversity. Jones also praised Tressel’s commitment, but wanted to see more follow through. Tressel recognizes that minority students remain skeptical. He believes that choosing people who are passionate about diversity and integration will allow them to carry the vision to others. 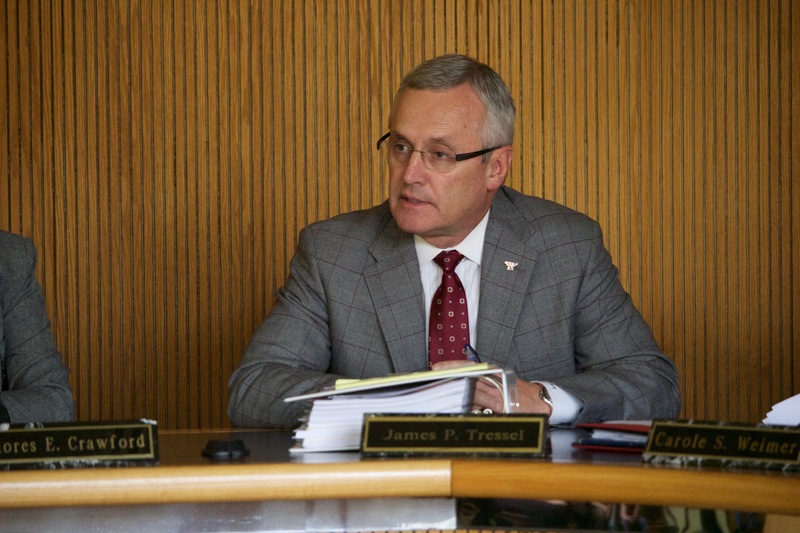 Echoing many student comments, Tressel and Imler said increasing the number of residents and engaging commuters will also increase minority involvement. “Probably the biggest thing you fight on a commuter campus is you put on a lot of activities and then no one comes,” Tressel said. Tressel said student groups play a role as well. If student groups are more welcoming, students will become engaged and a little bolder. The university is also in the process of transforming the entire first floor of Jones Hall into a multicultural center that will — along with the Culture of Community — attempt to better serve minorities. They plan to convert the third floor of Jones Hall into a student success center to help meet academic needs. Further down the road, Tressel would like to open up Kilcawley Center. “It is so carved up [right now] that if you want to go sit down with six people, you are segregated,” he said. Imler stressed that these efforts will not force assimilation, but prioritize minority students’ place on an active, integrated campus. Tiffany Anderson, director of the Africana Studies program, agreed, emphasizing the need to confront and discuss differences. Imler said this commitment to diversity is oriented toward educating the non-diverse population. She said professors have to adjust their teaching style to respond to students’ feelings of alienation. Though the Culture of Community could help, Imler and Blake also recommended diversity seminars or training reflecting Safe Zone Training. Anderson said another way to increase engagement and decrease segregation is not just more diversity curriculum, but diversity content integrated into previously existing courses. YSU student Ja-Michael Johnson said if he had not sought it out, he would have never learned about his heritage because of the euro-centric scope of American curriculum. Tressel said this needs to change because universities were created to foster responsible citizens, as well as provide knowledge. Anderson and several students agreed that requiring diversity classes for all students may help raise students’ awareness of the experiences students of color have on campus, even if there is some initial resistance. She asked a professor how Christopher Columbus discovered America when there were already people living here. He said Columbus was the first European to discover America. Victoria Shaffer, president of the YSU NAACP chapter, Jones, Anderson, Blake, Imler and Tressel all agreed truly effective solution will require the majority’s willing participation. He said some people need the truth presented to them, and people should discuss the issue with their family. This is the fourth of a four-part series entitled “Black at YSU,” examining the experiences of black students on campus.